Do your students know how to ASK and ANSWER WH questions? Do they need more practice? Only $2.50--Click the image to go to my Teachers Pay Teachers store! WH Definition Pages (Pages 3-8)= 6 pages, each defines a WH question (Who, What, Where, When, Why, How). WH Definition Matching Cards (pages 9-10)=Use these cards to have students match the WH question to what it asks. WH Quiz (page 35)= students draw a line from the WH question to it’s meaning. Then must pick two WH words and formulate their own questions. WH Question Die (page 36)= use this WH Question Die alone to have students formulate questions, and then practice answering their own questions. 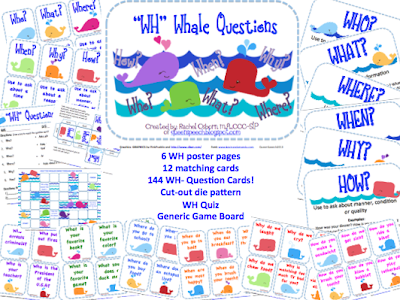 Use WH Question Cards, Whale Generic Game Board and WH Question Die together to play a game! Whale Generic Game Board (page 37) = use this in conjunction with WH question Cards, die or any other skill you want to target. Enjoy and let me know what you think of my new product! 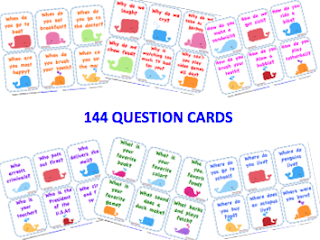 Just for fun I will be giving away a copy of my WH Whale Questions! Raffle ends Friday March 15th at 8pm! I like to target wh-questions with a good book - asking questions along the way. 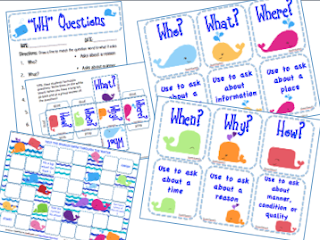 I've used Super Duper's wh question cards to practice basic questions, but I too, like to use books to practice basic questions and those that dig a little deeper. I like the above, but I'm finding lots of good activities on TPT. 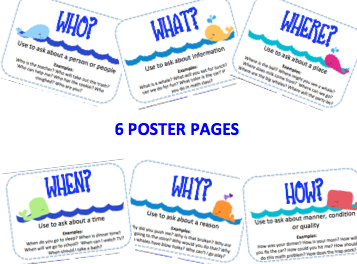 Thanks for posting, I should spend more time on TpT to find resources! I use a variety. I have a lot of young children so I use books, toys, and manipulatives. Also I have some TPT materials that I use with the little guys. With the older kids I like the Super Duper wh-cards and a lot of other TPT materials. This looks so cute! I have used Super Duper's Wh questions and my stidents with those and memorizing them! I have really enjoyed the book companions that I have purchased fro TpT to target comprehension. I love being able to tie in literacy as well as working on IEP goals. I love Super Dupers WH questions but I am soo SICK of them! Like you said, students memorize them! I included open and closed ended questions that way they can be used more than once! thank you! good luck in the raffle! I use the Super Duper & LinguiSystems "Wh" question flashcards, the Matt & Molly software, Buddy Bear Books. I try to make "When" visual by making a poster divided into the 12 months and we label it with birthdays & holidays and then practice answering "when" questions (also get their weekly schedule & make a daily calendar & talk about "when" they have gymnastics, church, etc.). That seems to be the best way to work on "when" so far but that one seems to be tough along with "why"... so abstract! Matt and Molly!? I haven't heard of that...will have to look it up. I just started using calendars in Speech. Many students don't know what day it is, my coworker uses these these connectable blocks to help students remember the day. Now I use them too! I try a variety of ways as well. For my MH population especially, I like to embed the questions in a good book, as there is so much more to talk about. Other time I use Super Duper or TPT flash cards. The iPad is always a favorite too! I should be using my iPad for more WH questions, I need to mess around with more apps. I like to take my data on my iPad so I need to get another one for apps! I have done all types of things! I use books and ask questions, I have a few apps the target wh- questions and I also have lovely materials from all of you wonderful SLPs who create materils. This packet is going on my wishlist! Yes! I used books this morning and I had so much fun! Like most, I have used a variety of things to target Wh questions - including the SD cards and bingo games, Buddy Bear books, and TpT resources. There are many SLPs creating and sharing such spectacular items! I also LOVE to use books when targeting questions. Thanks for sharing! I need to get my hands on some of these buddy bear books! I like to use books, SD & TPT flashcards and Apps. Thanks for the giveaway.